Firstly we need to obtain the device's IP address, in order to do this, please dial **** on the phone that you have plugged into the device. The default login is admin and admin for the device. If you have purchased this from Gradwell the username will be admin and the password is set to the last 6 digits of the MAC address. 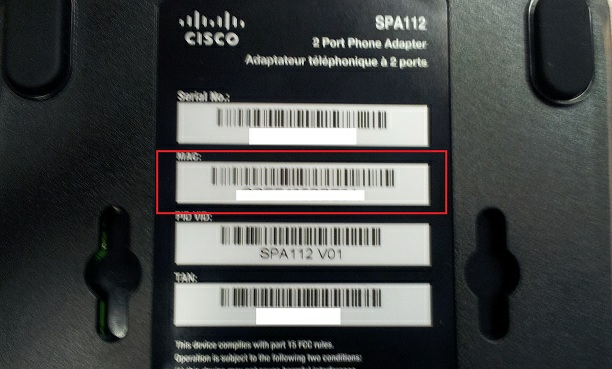 This can be found on the bottom of the device. You should then see the login screen for the device. Once you have logged in, you will be taken to the Quick Setup tab. The below details will need to be filled in. If your adapter is on a private IP address (ie 192.168.x.x) please ensure that you are using the outbound proxy nat.gradwell.net:5082.